"There is a critical need to establish embryonic developmental models using human cells. Not only could they advance our fundamental understanding of human development, they are also essential for regenerative medicine and for testing the safety of drugs and chemicals that pregnant women may need or encounter," said Jianping Fu, associate professor of mechanical engineering, who has been supervising the research. 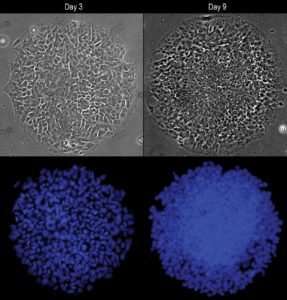 "For the first time, we are able to use human embryonic stem cells to develop a synthetic model of neuroectoderm patterning, the embryonic event that begins the formation of the brain and spinal cord in the human embryo." "The exact causes of neural tube defects are not clear, and there is currently no cure for them. Environmental factors, such as certain drugs pregnant women take, may play roles in causing neural tube defects," Fu said. 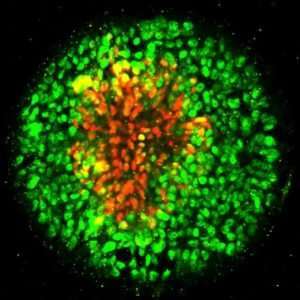 In the new study, Fu's research team arranged human embryonic stem cells into circular cell colonies with defined shapes and sizes. The cells were then exposed to chemicals known to coax them to differentiate into neural cells. During the differentiation process, cells in circular colonies organized themselves with neural plate cells in the middle and neural plate border cells in a ring around the outside. "Since all of the cells in a micropatterned colony are in the same chemical environment, it's amazing to see the cells autonomously differentiate into different cells and organize themselves into a multicellular pattern that mimics human development," said Xufeng Xue, a doctoral student in mechanical engineering working in Fu's research group. Xue is a co-first author of the paper. Fu's team observed that cells in the circular colony became more densely packed in the middle of the colony, where they became neural plate cells, versus the colony border, where they became neural plate border cells. Suspecting mechanical signals might affect their differentiation, they placed single human embryonic stem cells onto adhesive spots of different sizes. "While many current models attribute patterning of embryonic tissues to chemical gradients or cell migration, our results show that these factors may not be the only drivers," said Yubing Sun, a former doctoral student in Fu's lab and now an assistant professor of mechanical and industrial engineering at the University of Massachusetts. Sun is a co-first author of the paper. The study, titled, "Mechanics-guided embryonic patterning of neuroectoderm tissue from human pluripotent stem cells," is published in Nature Materials.